Explain the process by which electric signals are transmitted along a neuron. Explain the effects myelin sheaths have on signal propagation. Explain what the features of an ECG signal indicate. Electric currents in the vastly complex system of billions of nerves in our body allow us to sense the world, control parts of our body, and think. These are representative of the three major functions of nerves. First, nerves carry messages from our sensory organs and others to the central nervous system, consisting of the brain and spinal cord. Second, nerves carry messages from the central nervous system to muscles and other organs. Third, nerves transmit and process signals within the central nervous system. The sheer number of nerve cells and the incredibly greater number of connections between them makes this system the subtle wonder that it is. Nerve conduction is a general term for electrical signals carried by nerve cells. It is one aspect of bioelectricity, or electrical effects in and created by biological systems. Nerve cells, properly called neurons, look different from other cells—they have tendrils, some of them many centimeters long, connecting them with other cells. (See Figure 1.) Signals arrive at the cell body across synapses or through dendrites, stimulating the neuron to generate its own signal, sent along its long axon to other nerve or muscle cells. Signals may arrive from many other locations and be transmitted to yet others, conditioning the synapses by use, giving the system its complexity and its ability to learn. Figure 1. A neuron with its dendrites and long axon. Signals in the form of electric currents reach the cell body through dendrites and across synapses, stimulating the neuron to generate its own signal sent down the axon. The number of interconnections can be far greater than shown here. The method by which these electric currents are generated and transmitted is more complex than the simple movement of free charges in a conductor, but it can be understood with principles already discussed in this text. The most important of these are the Coulomb force and diffusion. 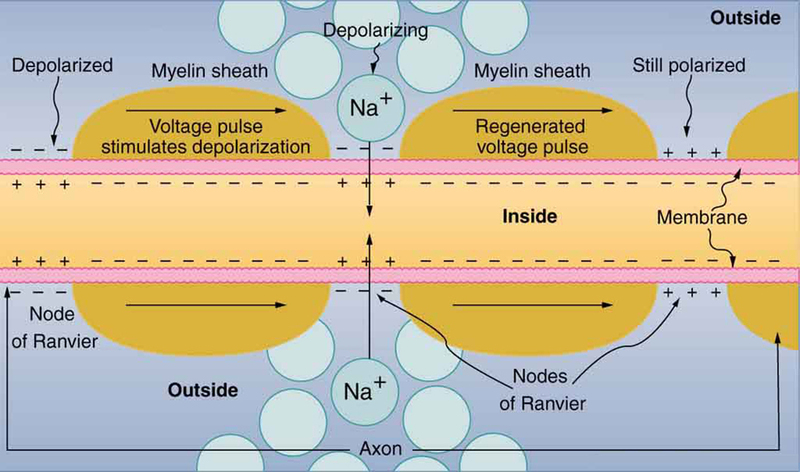 Figure 2 illustrates how a voltage (potential difference) is created across the cell membrane of a neuron in its resting state. This thin membrane separates electrically neutral fluids having differing concentrations of ions, the most important varieties being , , and (these are sodium, potassium, and chlorine ions with single plus or minus charges as indicated). As discussed in Chapter 12.7 Molecular Transport Phenomena: Diffusion, Osmosis, and Related Processes, free ions will diffuse from a region of high concentration to one of low concentration. But the cell membrane is semipermeable, meaning that some ions may cross it while others cannot. In its resting state, the cell membrane is permeable to and , and impermeable to . Diffusion of and thus creates the layers of positive and negative charge on the outside and inside of the membrane. The Coulomb force prevents the ions from diffusing across in their entirety. Once the charge layer has built up, the repulsion of like charges prevents more from moving across, and the attraction of unlike charges prevents more from leaving either side. The result is two layers of charge right on the membrane, with diffusion being balanced by the Coulomb force. A tiny fraction of the charges move across and the fluids remain neutral (other ions are present), while a separation of charge and a voltage have been created across the membrane. Figure 2. The semipermeable membrane of a cell has different concentrations of ions inside and out. 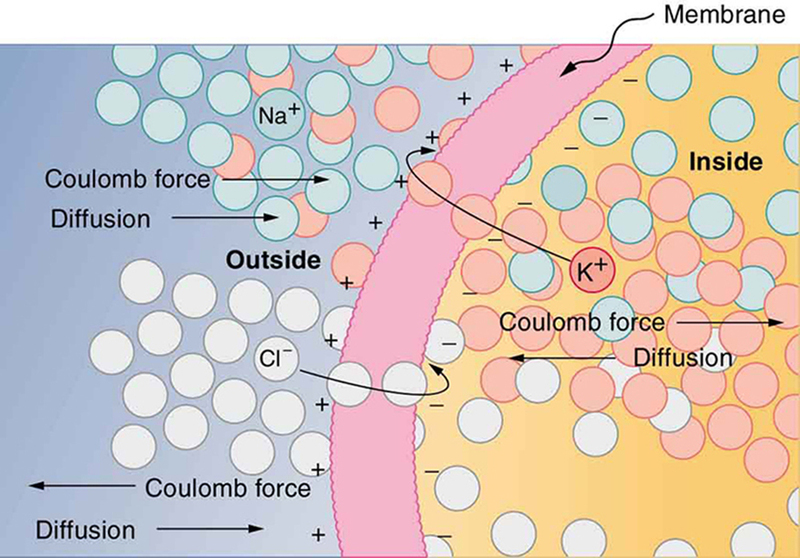 Diffusion moves the K+ and Cl– ions in the direction shown, until the Coulomb force halts further transfer. This results in a layer of positive charge on the outside, a layer of negative charge on the inside, and thus a voltage across the cell membrane. The membrane is normally impermeable to Na+. Figure 3. An action potential is the pulse of voltage inside a nerve cell graphed here. It is caused by movements of ions across the cell membrane as shown. 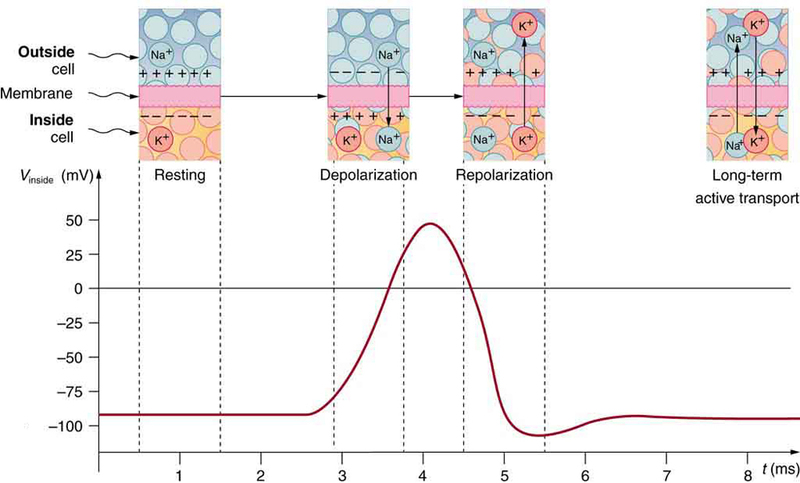 Depolarization occurs when a stimulus makes the membrane permeable to Na+ ions. 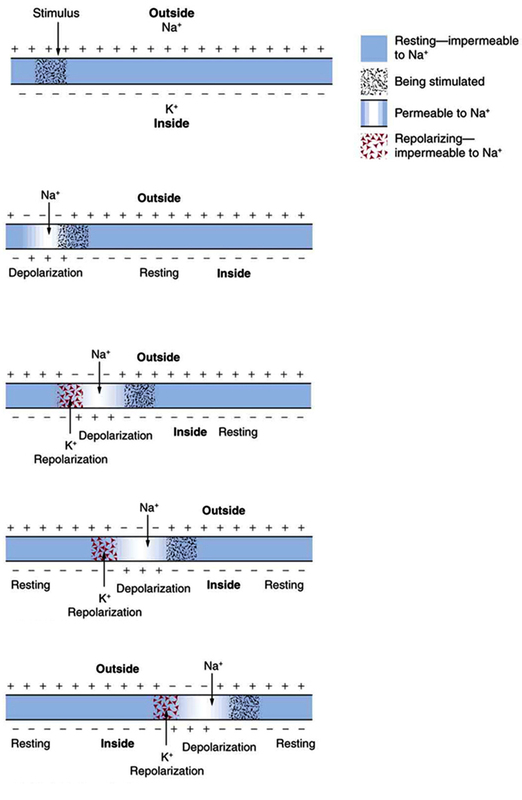 Repolarization follows as the membrane again becomes impermeable to Na+, and K+ moves from high to low concentration. In the long term, active transport slowly maintains the concentration differences, but the cell may fire hundreds of times in rapid succession without seriously depleting them. The separation of charge creates a potential difference of 70 to 90 mV across the cell membrane. While this is a small voltage, the resulting electric field ( ) across the only 8-nm-thick membrane is immense (on the order of 11 MV/m!) and has fundamental effects on its structure and permeability. Now, if the exterior of a neuron is taken to be at 0 V, then the interior has a resting potential of about –90 mV. Such voltages are created across the membranes of almost all types of animal cells but are largest in nerve and muscle cells. In fact, fully 25% of the energy used by cells goes toward creating and maintaining these potentials. Electric currents along the cell membrane are created by any stimulus that changes the membrane’s permeability. The membrane thus temporarily becomes permeable to , which then rushes in, driven both by diffusion and the Coulomb force. This inrush of first neutralizes the inside membrane, or depolarizes it, and then makes it slightly positive. The depolarization causes the membrane to again become impermeable to , and the movement of quickly returns the cell to its resting potential, or repolarizes it. This sequence of events results in a voltage pulse, called the action potential. (See Figure 3.) Only small fractions of the ions move, so that the cell can fire many hundreds of times without depleting the excess concentrations of and . Eventually, the cell must replenish these ions to maintain the concentration differences that create bioelectricity. This sodium-potassium pump is an example of active transport, wherein cell energy is used to move ions across membranes against diffusion gradients and the Coulomb force. The action potential is a voltage pulse at one location on a cell membrane. How does it get transmitted along the cell membrane, and in particular down an axon, as a nerve impulse? The answer is that the changing voltage and electric fields affect the permeability of the adjacent cell membrane, so that the same process takes place there. The adjacent membrane depolarizes, affecting the membrane further down, and so on, as illustrated in Figure 4. Thus the action potential stimulated at one location triggers a nerve impulse that moves slowly (about 1 m/s) along the cell membrane. Figure 4. A nerve impulse is the propagation of an action potential along a cell membrane. A stimulus causes an action potential at one location, which changes the permeability of the adjacent membrane, causing an action potential there. This in turn affects the membrane further down, so that the action potential moves slowly (in electrical terms) along the cell membrane. Although the impulse is due to Na+ and K+ going across the membrane, it is equivalent to a wave of charge moving along the outside and inside of the membrane. Some axons, like that in Figure 1, are sheathed with myelin, consisting of fat-containing cells. 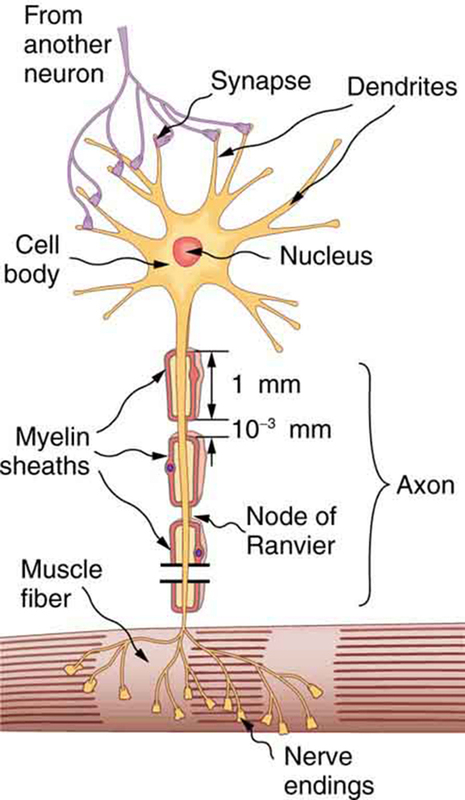 Figure 5 shows an enlarged view of an axon having myelin sheaths characteristically separated by unmyelinated gaps (called nodes of Ranvier). This arrangement gives the axon a number of interesting properties. Since myelin is an insulator, it prevents signals from jumping between adjacent nerves (cross talk). Additionally, the myelinated regions transmit electrical signals at a very high speed, as an ordinary conductor or resistor would. There is no action potential in the myelinated regions, so that no cell energy is used in them. There is an signal loss in the myelin, but the signal is regenerated in the gaps, where the voltage pulse triggers the action potential at full voltage. So a myelinated axon transmits a nerve impulse faster, with less energy consumption, and is better protected from cross talk than an unmyelinated one. Not all axons are myelinated, so that cross talk and slow signal transmission are a characteristic of the normal operation of these axons, another variable in the nervous system. The degeneration or destruction of the myelin sheaths that surround the nerve fibers impairs signal transmission and can lead to numerous neurological effects. One of the most prominent of these diseases comes from the body’s own immune system attacking the myelin in the central nervous system—multiple sclerosis. MS symptoms include fatigue, vision problems, weakness of arms and legs, loss of balance, and tingling or numbness in one’s extremities (neuropathy). It is more apt to strike younger adults, especially females. Causes might come from infection, environmental or geographic affects, or genetics. At the moment there is no known cure for MS. Most animal cells can fire or create their own action potential. Muscle cells contract when they fire and are often induced to do so by a nerve impulse. In fact, nerve and muscle cells are physiologically similar, and there are even hybrid cells, such as in the heart, that have characteristics of both nerves and muscles. 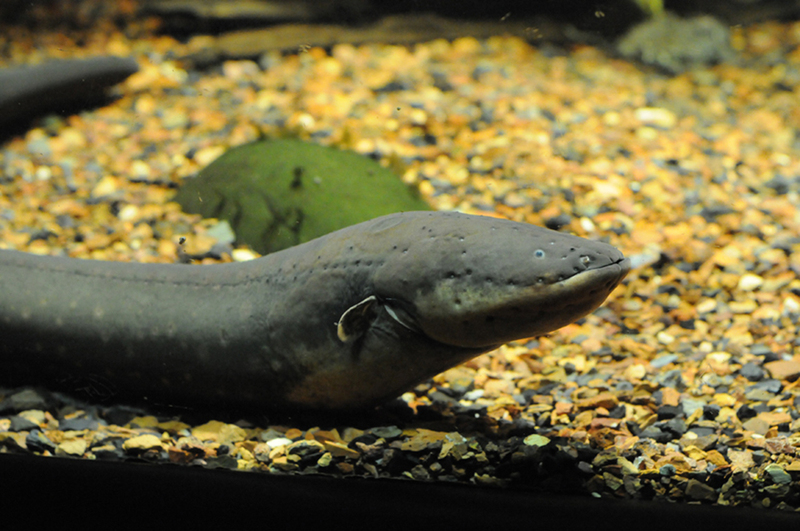 Some animals, like the infamous electric eel (see Figure 6), use muscles ganged so that their voltages add in order to create a shock great enough to stun prey. Figure 5. Propagation of a nerve impulse down a myelinated axon, from left to right. The signal travels very fast and without energy input in the myelinated regions, but it loses voltage. It is regenerated in the gaps. The signal moves faster than in unmyelinated axons and is insulated from signals in other nerves, limiting cross talk. Just as nerve impulses are transmitted by depolarization and repolarization of adjacent membrane, the depolarization that causes muscle contraction can also stimulate adjacent muscle cells to depolarize (fire) and contract. Thus, a depolarization wave can be sent across the heart, coordinating its rhythmic contractions and enabling it to perform its vital function of propelling blood through the circulatory system. Figure 7 is a simplified graphic of a depolarization wave spreading across the heart from the sinoarterial (SA) node, the heart’s natural pacemaker. Figure 7. The outer surface of the heart changes from positive to negative during depolarization. This wave of depolarization is spreading from the top of the heart and is represented by a vector pointing in the direction of the wave. This vector is a voltage (potential difference) vector. Three electrodes, labeled RA, LA, and LL, are placed on the patient. Each pair (called leads I, II, and III) measures a component of the depolarization vector and is graphed in an ECG. An electrocardiogram (ECG) is a record of the voltages created by the wave of depolarization and subsequent repolarization in the heart. 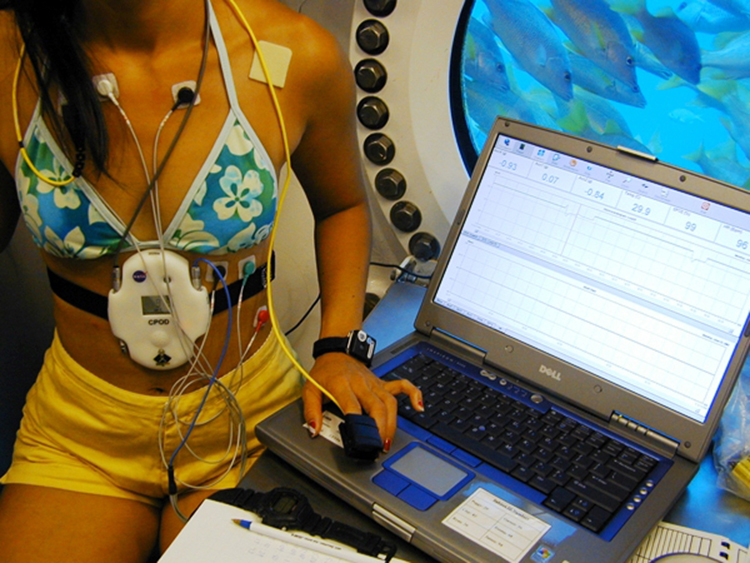 Voltages between pairs of electrodes placed on the chest are vector components of the voltage wave on the heart. Standard ECGs have 12 or more electrodes, but only three are shown in Figure 7 for clarity. Decades ago, three-electrode ECGs were performed by placing electrodes on the left and right arms and the left leg. The voltage between the right arm and the left leg is called the lead II potential and is the most often graphed. We shall examine the lead II potential as an indicator of heart-muscle function and see that it is coordinated with arterial blood pressure as well. 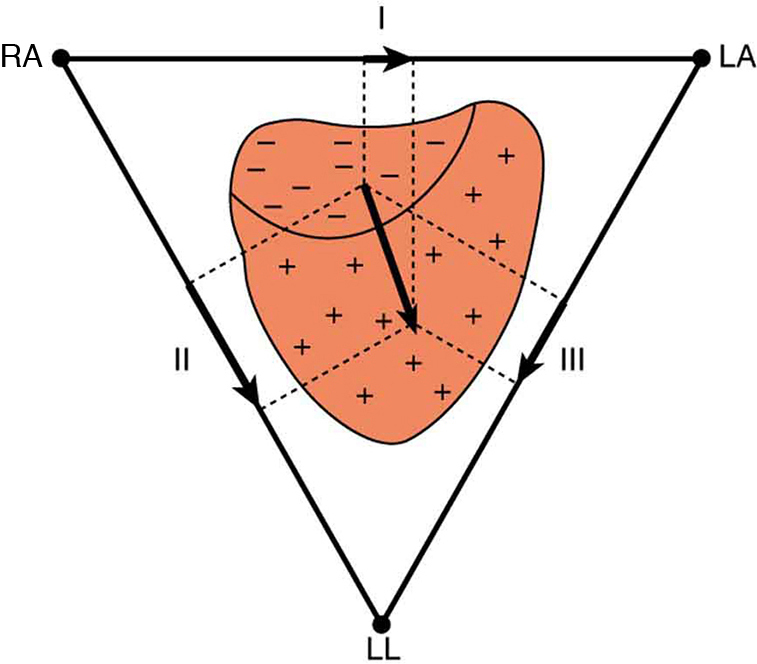 Heart function and its four-chamber action are explored in Chapter 12.4 Viscosity and Laminar Flow; Poiseuille’s Law. Basically, the right and left atria receive blood from the body and lungs, respectively, and pump the blood into the ventricles. The right and left ventricles, in turn, pump blood through the lungs and the rest of the body, respectively. Depolarization of the heart muscle causes it to contract. After contraction it is repolarized to ready it for the next beat. The ECG measures components of depolarization and repolarization of the heart muscle and can yield significant information on the functioning and malfunctioning of the heart. Figure 8 shows an ECG of the lead II potential and a graph of the corresponding arterial blood pressure. The major features are labeled P, Q, R, S, and T. The P wave is generated by the depolarization and contraction of the atria as they pump blood into the ventricles. The QRS complex is created by the depolarization of the ventricles as they pump blood to the lungs and body. Since the shape of the heart and the path of the depolarization wave are not simple, the QRS complex has this typical shape and time span. The lead II QRS signal also masks the repolarization of the atria, which occur at the same time. Finally, the T wave is generated by the repolarization of the ventricles and is followed by the next P wave in the next heartbeat. 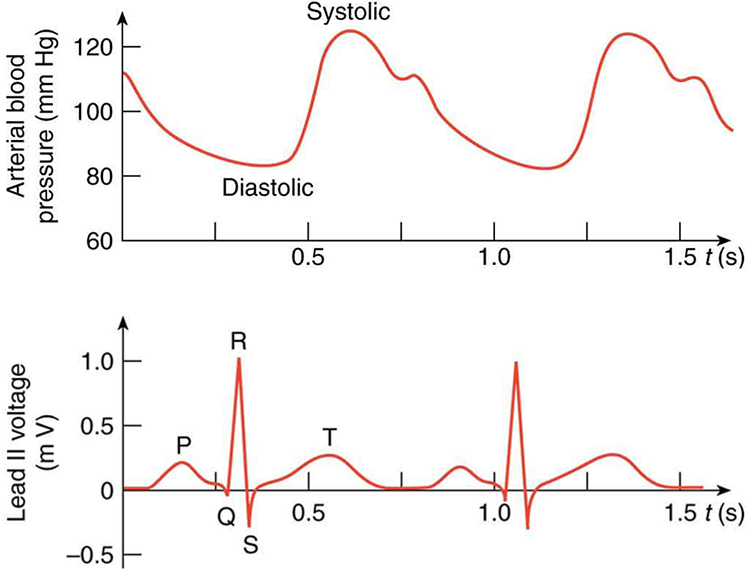 Arterial blood pressure varies with each part of the heartbeat, with systolic (maximum) pressure occurring closely after the QRS complex, which signals contraction of the ventricles. Figure 8. A lead II ECG with corresponding arterial blood pressure. The QRS complex is created by the depolarization and contraction of the ventricles and is followed shortly by the maximum or systolic blood pressure. See text for further description. Taken together, the 12 leads of a state-of-the-art ECG can yield a wealth of information about the heart. For example, regions of damaged heart tissue, called infarcts, reflect electrical waves and are apparent in one or more lead potentials. Subtle changes due to slight or gradual damage to the heart are most readily detected by comparing a recent ECG to an older one. This is particularly the case since individual heart shape, size, and orientation can cause variations in ECGs from one individual to another. ECG technology has advanced to the point where a portable ECG monitor with a liquid crystal instant display and a printer can be carried to patients’ homes or used in emergency vehicles. See Figure 9. Electric potentials in neurons and other cells are created by ionic concentration differences across semipermeable membranes. Stimuli change the permeability and create action potentials that propagate along neurons. Myelin sheaths speed this process and reduce the needed energy input. This process in the heart can be measured with an electrocardiogram (ECG). 1: Note that in Figure 2, both the concentration gradient and the Coulomb force tend to move ions into the cell. What prevents this? 2: Define depolarization, repolarization, and the action potential. 3: Explain the properties of myelinated nerves in terms of the insulating properties of myelin. Use the ECG in Figure 8 to determine the heart rate in beats per minute assuming a constant time between beats. (a) Referring to Figure 8, find the time systolic pressure lags behind the middle of the QRS complex. (b) Discuss the reasons for the time lag. 20.7 Nerve Conduction–Electrocardiograms by OpenStax is licensed under a Creative Commons Attribution 4.0 International License, except where otherwise noted.